In this task we are provided with two DEMs for Pats Cabin Reach of Bridge Creek. One was created from raw survey data collected in 2010 and the other from a survey done in 2011. Your job is to analyze this data for potential change in the channel, then create a map clearly illustrating any areas of erosion or deposition that occurred between 2010 and 2011. The DEMs you need for the analysis can be found in the Lab07_PatsCabin_DoDInputs.zip file. You will also want to download the DoD_Classed_2.5m.lyr file, because you will use the symbology from this layer to display your DEMs. Note: you don't need to add this layer file to your map. You will also create a model that automates the process of filtering out the noise in the DEM of difference (DoD) that you create. More details below. DoD (with 20 cm confidence threshold applied) displayed over DEM/Hillshade of Pats Cabin reach of Bridge Creek. Blue maps areas of deposition, red maps areas of erosion. Download the Lab07_PatsCabin_DoDInputs.zip file. Extract all files; you will only need the DEMs from 2010 and 2011. Also download the DoD_Classed_2.5m.lyr file. You will only use this for its symbology, so you don't need to add it to your map document. The reach has 13 beaver dams and/or support structures installed. After 2011 high flows, most of the top of reach ponds filled in completely with sediment. There was avulsion in the middle reach where significant downcut occurred as a result of the blowout of one of the major dams. The lower reach ponds aggraded substantially. You will build a model to automate the process of creating a DoD with the 20cm confidence threshold (steps 2-5 in the "A little more detail" section above). It might be helpful to run through the process so you know how the tools and inputs function. But you can go ahead and build the model first and use it to create a DEM of difference with the applied confidence threshold, if you feel comfortable with the process. You can use the following video tutorials to acquaint yourself with model building in ArcGIS. 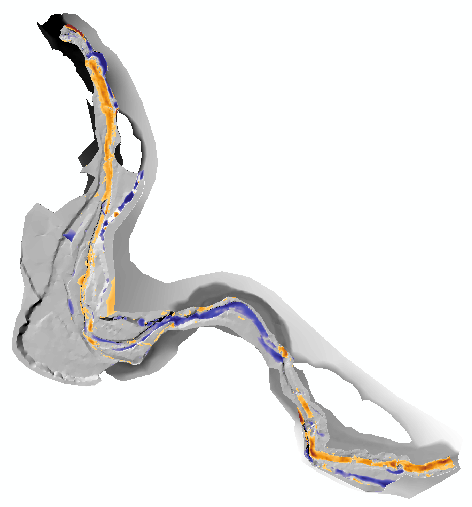 The tutorial uses a different work flow (watershed delineation) but the process of model building is the same and should be pretty easy to follow. Again, you might want to run through the Task 3 steps of creating a DEM of difference so you are familiar with the inputs each tool requires. If you want to follow along with the example in the tutorial, you will need only 2 inputs: a DEM and a pour point (provided in this Lab09.zip file). On your Lab 07 website, display a captioned figure of your DEM of difference model (can be a screenshot), and provide a link to download the toolbox. (*.tbx) that you made. Provide a link to download the toolbox *.tbx that you made. If you want a tutorial for creating a slightly more elaborate version of this tool, see here. Download data as described above. Evaluate your results. What are the range of values for this output raster? What are the units on these values? Does the range seem reasonable? Apply the color ramp (properties > symbology) "Cold to Hot, Diverging" to this initial DoD. Does the pattern make sense? Figure 1. Uncertainty associated with each elevation raster. In our case, we are assuming a 20cm span of uncertainty (+/-10cm). Figure 2. Varying levels of detection (LoD) in uncertainty analysis. Figure 3. 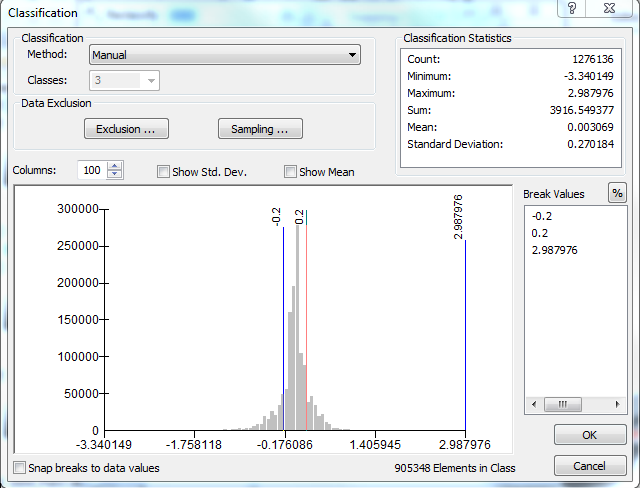 Brief explanation of the threshold histograms (seen in Figure 2) and how they are created. The first step is to reclassify the cell values of the initial DoD to create a binary output raster where cell values of 1 equal areas of certain elevation change (greater than 20cm change), and 0 values being areas of uncertain elevation change (-20cm to 20cm). Change the number of classes to 3. If the window is greyed out, temporarily change the classification method to equal interval (ArcGIS glitch). In the Break Values section, change the breaks as shown above (you are setting the 2 breaks and leaving the max value alone). Click OK to return to the Reclassify window. In the New values column, reassign the value "1" to all "true" cells (cells with certain elevation change) and assign NoData to the class of uncertain elevation change as shown below. 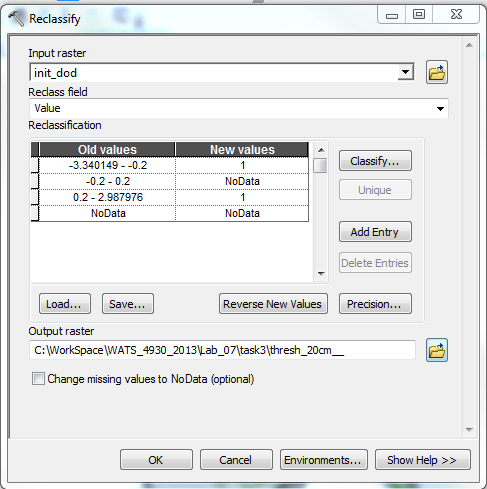 Set your output location and OK to run the reclassify. This output will essentially be used as a mask, as you will see in the next step. The second step is to multiply your original (initial) DoD with the newly reclassified raster (values of 1 and NoData). This will create an output raster that preserves DoD elevation changes we are highly certain about and removes all elevation changes that are uncertain. If you multiply a cell value by NoData the output is NoData. Therefore the only elevation values that will be output will be in the areas we are certain about. You are ready to symbolize your data in a meaningful way. In the final DoD raster's properties, go to the symbology tab and click to Show: "Classified" values on the left (see below). The symbology you want to import is classified, so you have to take this step for the import to work. Click the Import button and navigate to the Dod_classed_2.5.lyr you downloaded earlier. If you are confident in your results, create a map illustrating the change in the channel from 2010 to 2011. You have full creative license to display this data in the most effective and convincing way. See What to Submit section on main Lab 7 page for specific submission details.